Gurukul follows CBSE curriculum in a very refined way, which makes the learning an enjoyable and unique experience. We call this "GPEP (Gurukul Progressive Education Program)"
A child centered activity based curriculum is the highlight of the school and the curriculum is very meticulously planned keeping in mind the age-group of the children and their heterogeneous mental levels. Contemporary teaching methodologies and infrastructure further facilitate faster and better learning. The curriculum is also scientifically designed to coincide with the key personality areas. The aim at the end of the day is a smile and undoubted pride on every Gurukulite. A Crucial factor that moulds the personality of a child is the environment to which they are exposed. Need not say that no place can be a better place than school for personality development. Gone are the times when school used to be mere chalk and duster classes. Now a day’s school is becoming more activity oriented and interactive. School gives a broader perspective on life, more knowledge and broader platform to share views and gain experiences. More importantly, they help in development of cognitive, behavioural and emotional intelligence part of one’s personality. At our school we take full care to provide a nurturing environment and that inculcates good values and provides an opportunity to the child to develop a personality that will make him stand out in the crowd. Value based teaching in school where all teachers involved in teaching scholastic or non scholastic section incorporates the following skills of SELF AWARENESS AND EMPATHY , CREATIVE THINKING AND CRITICAL THINKING, DECISION MAKING AND PROBLEM SOLVING, EFFECTIVE COMMUNICATION AND INTER PERSONAL SKILLS, COPING WITH EMOTION & STRESS. Life skill is an integral part of our regular pedagogy in Gurukul. The school hosts events which break up the routine and where pupils can meet their peers from different classes. The events also help in developing a strong link between experiences of celebrations and the school spirit and general atmosphere. Students are sent on field trips to have a better grasp of the content that they theoretically learn in class rooms. They visit places like industries, construction sites, dairy farms, bakery, banks, supermarket, parliament etc. This helps the child to develop the insight and inquisitiveness to learn things with ease. These trips are properly and meticulously planned by the team of teachers and experts. Sports in Gurukul are the tools for building Stamina, Speed, Strength, Skill and Spirit. Our pristine playgrounds and prodigious basket ball courts are essentially designed to provide rigorous training regime during and post school hours. They are structured for hosting tournaments and events of national acclaim promising optimum gaming exposure to the Gurukulites. A vivid range of outdoor games have taekwondo, cricket, hockey, table tennis, skating, basketball, volleyball at the offing. In the arena of indoor games, the school offers proficient guidance in judo and yoga. While rigorous training of yoga is imparted inside the tradition inspired huts, we have world class carpeted, mattress flooring in the huge Judo room, to make the toughest training every judoka's delight. All the amenities in terms of latest sports-equipments, State and National level coaches and handsome scholarships are provided to national level players to motivate them to scale greater heights. In perfect sync with CBSE's latest inventions, the school has an extensive range activities to cater to both the scholastic and co- scholastic domains. In our studios of skill building, we offer training in various art forms, sculpture, vocal and instrumental music. A plethora of dance forms including hip-hop, Jazz, Indian classical dance, are taught by the master blasters of these fields, so that our students do not just learn and enjoy them but also may opt for these as their career option and pursue their dreams. Effective communication and correct body language boost up one’s confidence which further sharpens and improves individual’s personality. People with good communication tend to have better and impressive personality day in and day out, our teachers with their persistent behavior train students on how they should speak, their pronunciation, their body language. We also have dedicated faculty for spoken English and presentation skills. Our students enjoy these classes as we use different and interesting methods to train them. This is the first exposure of the child to a school system before his formal schooling begins. The emphasis here is on the development of language through the four skills listening,speaking,reading and writing . The activities and days are planned in such a way that the child learns something new every day. The activities are meticulously planned and the expectations of the child are kept in mind so that the child waits and does not want to miss the school even for a single day. The facilitators “make” it a point to reach out to every child. Children are provided with rich and nutritious meals to inculcate good eating habits. This also instills in them the skills like knowing about healthy food, table manners, sharing and other important values which becomes the foundation for the entire life of the child. The Birthday of every Gurukulite is celebrated in the school in the form of monthly Havan being performed by the children whose birthday falls in a particular month. Kathashala is our story telling room. The reason to have a specific story telling room named as Kathashala is to bring the culture of storytelling back to the childhood. Children relive stories and give wings to their imagination here. They listen to stories in a very informal atmosphere and share a special bond with the story teller. Retelling stories, role plays, making props and reading books bring out the best in each child and facilitate cooperative learning. Telling stories using puppets is the closest to the heart of all. The observations of the teacher about every child she is dealing with are recorded in the student profile register which shows the progress in his development over the session. The child competes with himself. For 1st & 2nd-grade children, the program builds on the skills already developed and children continue to learn in a nurturing and hands-on learning environment. There is a strong commitment to the child, with the programme fostering each child’s intellectual, physical, emotional, social, cultural and artistic growth within a rich and stimulating environment. The children have fun and enjoy the activities like Double Rope, Net Crawl, Tunnel Crawl, Australian Trolley, Ladder, Tent pitching and confidence building exercises like Burma Bridge, Artificial wall climbing & Commando bridge. Primary School students have an opportunity to participate in a no. of co-curricular school activities offered through the P.Ed Cards (PEC) programme of CBSE. Primary School is a comfortable place for children to learn through exploration, while instruction becomes increasingly more structured as each child develops and matures. One of our major goals for students is to find joy in learning while developing specific skills, applying concepts and exploring ideas. The GPEP program emphasizes the development of language, writing and arithmetic skills, while integrating Sci. and Social Studies(EVS). In addition to learning core academic subjects, children need to grow in other areas that are equally important in the development of a well-rounded individual. Teachers who have been specially trained in their subject area provide an enriching experience to all students through a curriculum that includes regularly scheduled classes in English, Math, EVS, Hindi, French, Computers, Art, Music and Physical Education. Classroom activities in a rich environment are supplemented by a variety of additional experiences that includes visiting artists, performers, and authors, field trips, drama, role-play and story-telling, life skills, library activities, extracurricular opportunities. Parent volunteers are encouraged to participate regularly both in and out of the classroom throughout their child’s Primary School experience. They are invited as judges in interclass competitions. Develop a positive view of themselves, their classmates and the educational experience. Develop their natural curiosity and creative expression through art, music and dramatics. Broaden their perspective through educational field trips. "School is a shrine where childhood is celebrated, learning is rejoiced, values are ingrained and…… the future of a civilization is framed…..!! " With a firm belief that the purest feelings of children's hearts, come out effortlessly when they find proficient teachers, and a futuristic guidance, we continuously strive to sow the seeds of curiosity and instill the urge to explore in our students; especially in the most formidable years of their life - the adolescence. The global tide of technology is used as a learning tool at Gurukul. Our proficient team of teachers, helps the students develop the key skill of locating desirable knowledge from the vast expanse. Our ultra sonic computer labs, chemistry lab, biology lab andMaths lab are all equipped to make learning a joy. The wi- fi enabled sprawling school campus, provides an easy access to a vast pool of information in every corner of the school, to make teaching more impactful. Used as diagnostic tools, they inspire us to evolve our teaching practices, in accordance with our learners to bring out every child's best. Under the expert guidance of skillful teachers and trainers, the students are motivated for an inspired participation in Olympiads and countrywide competitions designed to trace student prodigies. Our participation in competitions of national acclaim fetches a cutting edge to the students in the selection procedure of eminent colleges and universities. Our assessments are not the yardsticks to measure a child's potential with bars of judgment. We design them to serve us as windows to ascertain the effectiveness of our teaching. Conducted continuously and at regular intervals, our dynamic assessments, comprise of four Unit tests, at regular intervals and the bi- annual Summative Assessments, that summarise the child's growth in both the scholastic and co-scholastic domains. 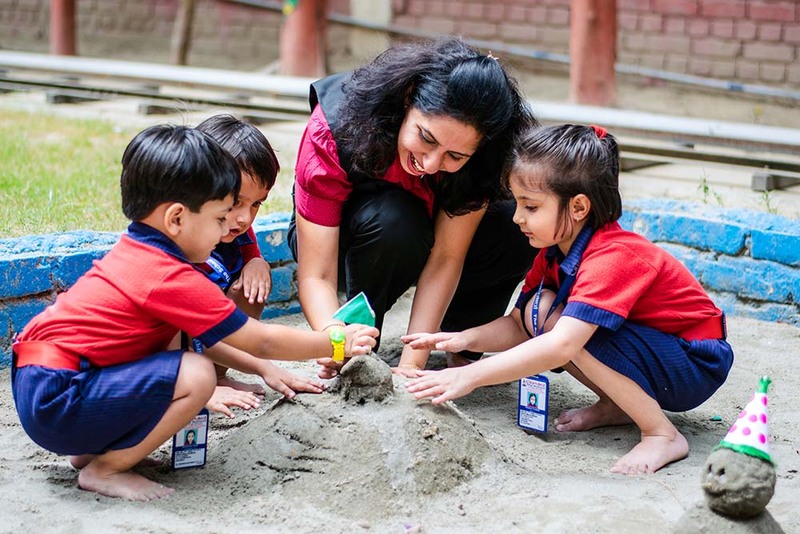 Our operational imperatives, work on the identification of each child's uniqueness through project based, interdisciplinary and analytical approach to teaching and learning. Avenues of various Intra Class, Inter Class and Inter school competitions, are created to let the students prove their mettle by rubbing their shoulders with their counterparts, explore wide horizons while steering clear of unhealthy competition. We relentlessly work on the identification of every child's unique intelligence, and commit ourselves wholeheartedly to create opportunities to optimize their potential. Various avenues of learning and exploring inside and outside the boundaries of school are created to foster an independence of thought, and appropriate decision making. With a fine underpinning of our vision statement, ‘education empowers the child, influences the home and transforms society’; Gurukul Progressive Educational Program,(GPEP) is designed, and evolved continuously in accordance with the global trends. With an all new and ever comprehensive approach to education, the school provides proficient training in all the six subjects i.e. Mathematics, Science, English, Hindi, Social Studies, and Computers, along with the provision of Sanskrit and French as the third language. All the four Cs, of our school- Classroom, Corridor, Campus and Community, teamed with our insightful teaching pedagogies, work hand in hand for the creation of skillful and contributing citizens of society. We have redefined our house system, and launched an all- new Class Ranking System, where each class - under the captaincy of Class- teacher, contests for the 'Best Class of the Year' trophy by participating in various competitions, and an array of activities such special assemblies, speaking walls, information boards and participation in scholastic and co-scholastic competitions. The meticulously conceived parameters of assessment encourage a preference for self-discipline over imposed discipline. The students grow up with the realization of accepting the responsibility of their actions, on-guard or off- guard. The undergrads who are on the threshold to move into colleges and about to leave the Alma Mater get ‘hands on experience’ to a series of activities and events which prepare them for life. These students are given experience and excitement of discovering their capabilities through classrooms activities, stagecraft, International Exchange Programs, Sports activities, Class Presentations, Techspree, Orientation Day Program and many more such events thoughtfully mapped in the School Calendar. One of the primary reasons why students choose to participate in student exchange programs is for the learning opportunities they provide. These students learn to analyze the things around them in a constructive manner and learn how to solve problems on their own. By having the opportunity to discover themselves in a place that is unfamiliar to them, students develop self-awareness and self-esteem in a manner that cannot be duplicated. These students learn the ability to confront social challenges outside of their comfort zones and deal with problems head-on. Also, exchange students learn to live in their host families’ households, and this increases the value they place on home and family life. They will also learn how to form their own opinions about the things that matter most to them. The school has successfully conducted the student – teacher exchange program with Poland, Indonesia, USA, Germany, China, Ireland and many more. Our students have attained hall mark of success at Kishore Vaigyanik Protsahan Yogana (KVPY) on one hand; and reached The National levels in CBSE Science Exhibition on the other. Our students have proved their mettle at all major competitions both in academic and co-curricular areas. Through our students’ participation and success in National and International Olympiads and SGAI we have proved that Gurukul The School is in line with best teaching practices of the world. We do not teach pupils only to attempt but also provide conducive environment and ambience in which they learn. The goal of education here is not to cover the syllabus alone but to uncover knowledge. The quality education is not contextual but self referral. In the Senior Wing at grade XI the students are given an opportunity to select stream- Science, Commerce, Humanities, of their interest from various options available-Physics, Chemistry, Mathematics (PCM), Physics Chemistry Biology (PCB), Commerce with Mathematics including Business Studies, Accountancy, and Economics. Commerce without Mathematics, with the choice of Informatics Practice (I.P) Computer Science (C.S) Entrepreneurship (E.P) Fine Arts and Physical Education.Humanities including Geography, History, Political Science. English Core happens to be Compulsory subject for all domains. The students are selected for their desired stream provided they have the right aptitude, attitude and meet the eligibility criteria. The opportunities provided at GurukulThe School encourage the students to gain multiple ability to help them combat the rapid changes in today’s world. Academic Rigor and proven results speak volumes for every educational institution. AT GurukulThe School we aim at quantitative results with qualitative insights and this has been possible because of the committed and dedicated teachers. A Gurukul teacher equals the best professionals in other fields be it Law or Medicine. They have gone beyond ‘chalk and talk’ methodology of teaching and made learning more interactive making use of Smart Boards for we believe that only way to improve the outcome is to improve the instructions.